Think of a farmer hoeing or weeding in the sun for hours. He is hungry and thirsty but does not want to stop for refreshment just as yet. He simply reaches for a handful of tiny, pale peach-coloured cucumber-like fruits, growing wild on the farm boundary. 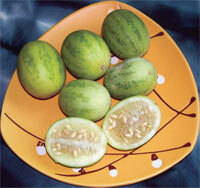 The flesh is bland with just a hint of sweetness, but its intense aroma, resembling that of ripe muskmelon, soothes him. The core is watery, sour and tangy—just what one needs to satisfy the cravings. Till about 20 years ago, the wild fruit (Cucumis callosus), known as selni in Maharashtra, kachra in the tribal areas of Madhya Pradesh and demu or pehta in Chhattisgarh, was a regular feature of farm life in the central India. The thin, trailing vines, resembling that of bitter gourd, were found virtually everywhere in farms, yards and on household fences. “We would be tired of uprooting them,” says Sukhwanti Bai, farmer from Multai town in Madhya Pradesh, who showed Down To Earth how to cure the fruit for storage. But farmers would let a few vines remain along the farm boundaries or on the household fence, for it is a ready snack for farm workers, passersby and children from September to November. When raw, the fruits are used for making chutney (a spicy, tangy dish). The half-ripe fruit can be sundried and stored as dried flakes, called selni khula. 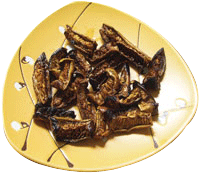 In the summer, when vegetables are rare, slices of crispy, fried selni make a delicious addition to monotonous meals. Though wild cucumber is native to India, other than its cooling effect, very little is known about its nutritional property. A few elders recall they used to apply the half-ripe fruit, pounded and heated over hot coals, to painful, inflamed wounds. But the practice is forgotten. Its flavoured seeds are nutritious and have cooling effect, says Bai. But its dried flakes are the real favourite, she adds. Wash the fruit and wipe it dry. Slice each into four vertical sections, and sun dry for four to five hours. Beat curd and salt in a large utensil, add the slices and mix well. Leave overnight. Next morning, take the pieces out of curd and spread out on a plate under the sun. Reserve the leftover curd. Put the slices back into it in the evening. Repeat the process for three days, by when the slices would absorb the entire curd. Sun dry them for a few more days till they become dry. Store in a jar. Heat oil in a pan, add a handful of selni khula and stir fry till crisp. The pieces will swell and change shape. Keep stirring to avoid burning. It takes a minute to be done. Serve to enliven simple meals. Slice the fruit into thin strips. Heat oil and splutter mustard and cumin seeds. Add onion, fruit pieces, and then salt, tumeric and chilly. Cook till fruit is soft. Add ginger-garlic paste and tomatoes. Keep stirring intermittently till the ingredients are blended well and moisture has dried up. The preparation should resemble a paste. Serve with rice or chapattis. 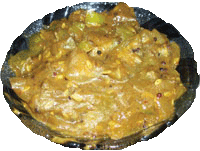 It is a delicacy in Rajasthan, eaten with relish. Did not know it was a weed! Kachra eaten as a fruit; as an indegrient in cooking; as aachar! If it is not formulated cultivated till now, it is high time it is promoted as such.